Release doesn't feature an explicit title, as with the original issues. 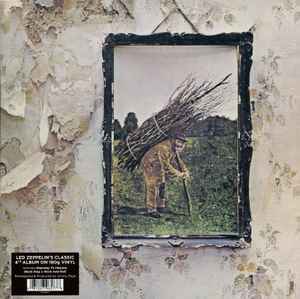 It is, however, referred to as "Led Zeppelin IV" in online retailers and such. 180gr vinyl in gatefold sleeve with insert. I compared this to a '77 repress and overall, the older LP, not in the freshest of condition anymore still sounds more dynamic compared to this new remaster. If I did not have another to compare it to, I may not mind as much but this new version can be a bit high on the treble and does not provide much of a thump to the bass or drums as I would like. Jimmy's guitar and Robert's vocals do sound quite good and nicely spread apart, the solo on Stairway shreds. My remaster copy does not seem to be as bad as some others have experienced, mine is good for what it is but I will still be looking to replace it for a nicer 70's press. I don´t know how they made this edition but to me, this vinyl version sounds flat, more than CD. Don´t buy it. It is cheap, but it sounds so compressed that I dont think I will listen to it many times, so now I feel like I threw my money to trash. No, there is no soul here man, even when we are talking about Led Zeppelin. Rock likes analog sound, not digital. Now I know why is so cheap: no one wants this and they have to get rid of it somehow. I cannot compare with another vynil version, but mine sounds quite well vs the CD version I know. Considering the low price it is sold here in France, it's worth the money. So what people talk about when they think this remaster sounds bad is most likely the digital aspect. I myself was expecting this to be a great sounding issue but after listening I felt like it was missing something and still prefererad my older 70s issue. I thought it had a lot of detail with a clean press but for some reason sounded like a CD of sorts. Later I found out that these 2014 reissues are made from a digital source of the original tapes which I reason is why it sounded strange and not as engaging. Im not one to start digital vs analog wars, I think both can be great, but this time without even knowing it I could hear the difference. If you are looking for the best sounding new versions of these albums I hear that the Classic Records releases are a good choice. They are very expensive but are made by people who really care and only do analog pressings. I myself am getting one and doing a blind test to see which I think sounds best between the 70s issue, 2014 remaster and 2007 Classic Records version. In the end its a good record and if you dont mind that much its just a great deal, but personally I would go for older 70s reissues that are in NM condition over this. Good quality record of an amazing LZ release. Clear and wide ranging sound too. I was a bit skeptical buying this pressing based on the reviews and comments posted but I'm pretty happy with my copy. I cleaned the stylus before playing, the record with cleaner and a brush plus used the anti-static brush. No surface noise at all, no crackles or pops or skips. Very enjoyable to sit and listen to. Sure it isn't the most dynamic sounding pressing I've ever but as a casual Zeppelin fan I'm happy with the pressing. My copy of this pressing sounds different to me than the other reviews. It is lively and dynamic in the mids, but really very brittle and thin which doesn't blend with the low-end at all. All the power and glue from the low-mids has disappeared. I do agree that the end result really isn't that good, even for the affordable price it's retailed at. i agree the sound quality on this pressing is so flat sounding with no oomph. I really think this sounds like muck it's so boring and flat disapointing.